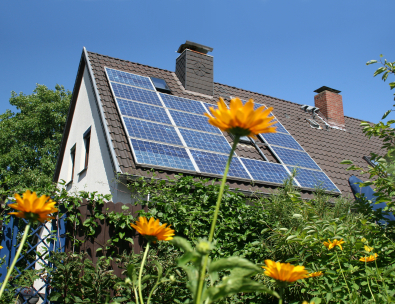 Once you’ve decided to purchase solar panels, the next question is, where do you put them? Obviously they need sunlight to operate (though some people have the misconception that it needs to be sunny and hot, they will still produce some electricity on a cloudy day and heat is irrelevant so they’ll work just as well on a bright, clear winter’s day as in high summer) so naturally the best place to put them is where they’ll get the most exposure. The thing is however, the sun moves through the sky throughout the day and will be at different angles at different times of the year, so to get the most out of your system you need to establish the optimum direction and angle. Regardless of where you are on the planet and regardless of the time of year, the sun will of course always rise in the east and set in the west. As we in the UK are in the northern hemisphere therefore, and the sun is above the equator, your solar panels will work best if they are south facing. This is because they will be facing the sun all day long. North facing panels will be facing away from the sun and will be inefficient. If it is not possible for you to face the panels south (for example you need them to be roof mounted and roof faces east/west) then it is estimated that you will lose around 16% efficiency for west facing panels or 18% for east facing. This is a significant loss though perhaps not as large as some might imagine. For north facing panels you would lose around 39%, making them impractical, certainly in the UK. It is of course possible to have two arrays of solar panels, one on the eastern half of a roof and the other on the western half, so as to catch the sunlight all day, though obviously this would be more expensive to purchase and install. What Is The Best Angle For My Solar Panels? Whilst everyone can easily agree upon the optimum direction for solar panels, the question of angle of tilt is less straightforward. On the equator it is simple – horizontal (90 degrees) is best as the sun will be directly above. At the poles the sun will always be near to the horizon so vertical (0 degrees) is best. At other latitudes, such as the UK, the sun will appear at a different angle relative to the Earth at different times of year (i.e. it will be lower in the sky in winter and higher in summer). This means that if you point your array at where the sun will be at midday on the summer solstice (midsummer) then you may maximise summer efficiency but you’ll lose out in winter when your array will be pointing “over” the sun. Most people have the panels mounted on the roof of their homes. This has a few of advantages. The solar panels are better protected in high winds because they are flat to the roof, in most cases (except in Northern Ireland) no planning application will be required and because they will generally be level with or above surrounding buildings there is last chance that the solar panels will be in the shade at any point. One disadvantage however is that generally the angle of the solar panels will have to be the same angle as the roof. It may be possible to angle it away from the roof a little however this could trigger the requirement to apply for planning permission. Even then, because of the practical difficulties of accessing the solar panels it is likely you will be limited to one angle all year round. If you do have a choice of angle then one way of deciding on the best one is to use a solar angle calculator (there are a few available online which are free to use) to find out the optimum angle for each month of the year then working out an average. In Leeds, England for example this works out to 36 degrees. Using this method will give you an average performance throughout the year. These means that compared with, for example, optimising for summer, you’ll lose a little performance in the summer but will gain in the winter. As the days are longer in summer and the weather is more likely to be clear, solar panels will produce more energy than in winter, so if you are looking to get the maximum amount of energy out of your solar panels without adjusting them through the year then find out the optimum angle for June and set your array at that angle. You might want to do this if you are claiming the feed in tariff and want to produce more excess energy to sell back to the grid. During the summer months you might find that (during the day) you are generally producing more energy than you can use. It might therefore be that if you optimise your solar panels for winter, by pointing them at a much lower angle, you still produce enough electricity in summer while producing the maximum possible in winter. Optimising for winter will mean you will sell less energy back to the grid through the year (since you will produce less in summer and will almost certainly not produce an excess in winter) but you will minimise the amount you need to buy to cover periods when your panels are not producing enough. Solar panels do not have to be attached to a building. Provided they are within a reasonable distance (say 50 metres) they can be mounted on poles. This is great if you don’t have a south facing roof which can accommodate the solar panels, or if your roof is in the shade of a nearby structure, but it also allows you to be much more flexible with the angle which you point the panels. There are disadvantages too, the panels will be more at risk from wind damage, will be more susceptible to shade (because they will usually be at a lower level) and it might be that they will not be classed as “permitted development”, meaning that a planning application may be required. Free standing panels should be adjustable manually. Obviously it would not be practical to adjust them throughout the day to track the sun across the sky, or even daily to take account of the increases or decreases in the angle of the sun as the year progresses, but you can and should adjust the angle at least bi-annually to take account of summer and winter and preferably monthly. As mentioned above there are simple calculators on the internet that will give you the optimum angle month by month for your region or town. Shade is the thing that will have the biggest negative effect on the efficiency of solar panels, and it can even cause damage. Before deciding how to position them therefore you should assess the area to see whether there are any surrounding structures or trees as well as moving throughout the day, shadows will be in different positions throughout the year due to changes in the angle of the sun, so if you are in doubt you may need to make an assessment over a six month period in order to see the full range of shadows. You’ll also need to check at different times of the day. There are computer models available that will give a virtual picture, which would avoid the need to measure over an extended period. The best way to ensure that you get maximum efficiency from your solar panels is to use a solar tracking device. A dual axis system (one that tracks the sun across the sky and adjust the angle of the panels according to the height of the sun in the sky) could increase efficiency by 30% – 40%. Such systems are expensive however and it may be more cost effective to either purchase additional panels or simply accept the lesser efficiency of a fixed array. As well as the initial expense, solar tracking devices tend to need more maintenance than fixed arrays because they have more moving parts. Can you place solar panels on 3 different aareas of a roof ie 3 on south facing bit , 5 on east facing bit and 2 on south facing lower roof? Would it make it difficult/impossible/difficult to connect up ? Well said, but we all need to realize that adding Solar in their property is an asset that could increase the future value of their home if / when they choose to sell. With the environment the way it is going we simply cannot disregard any system that gives 100 % free power at no cost to both the client and more notably the world! MY LATITUDE IS 36 DEGREES, 27 MINUTES, 122 SECONDS NORTH. IF I FACE MY PANELS WEST WITH A TILT OF 18 DEGREES WHAT KIND OF EFFICIENCY CAN I EXPECT?